Do you know why normalizing your clinical and claims-based data is so critical? 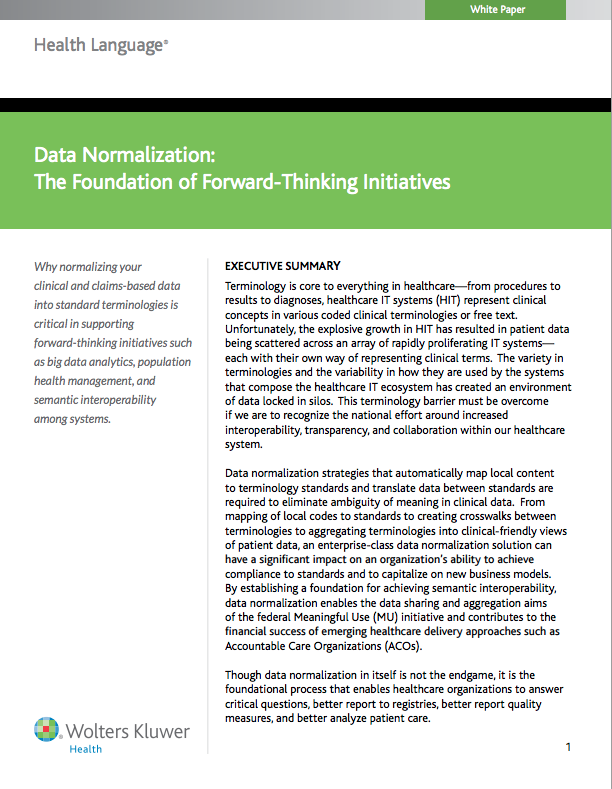 It’s because data normalization is the foundation that enables healthcare organizations to better report quality measures, better analyze patient care, and improve analytics. Transforms structured and unstructured data into reliable, meaningful information that can be mined and shared with other systems across your enterprise. Improves your population management initiatives by leveraging clinical data such as labs, drugs, and problem lists. Provides better reporting and analytics by displaying a more accurate picture of performance that includes all the data contained within the healthcare system. Is critical to achieving higher levels of interoperability. Discover the challenges, limitations, and dangers to organizations when big data is locked in silos, and see suggestions to help you develop your own data normalization strategy.